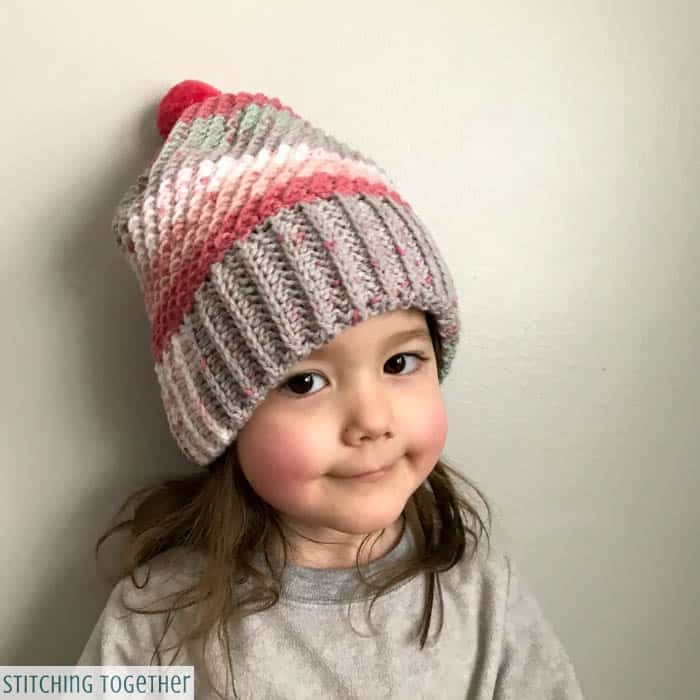 The Over the Ridge crochet hat with a band was meant to be a brimmed version for my daughter of the Over the Ridge Boy Hat I made for my son. Since I have been making things for my son, my daughter has been asking for more crochet items for her too. 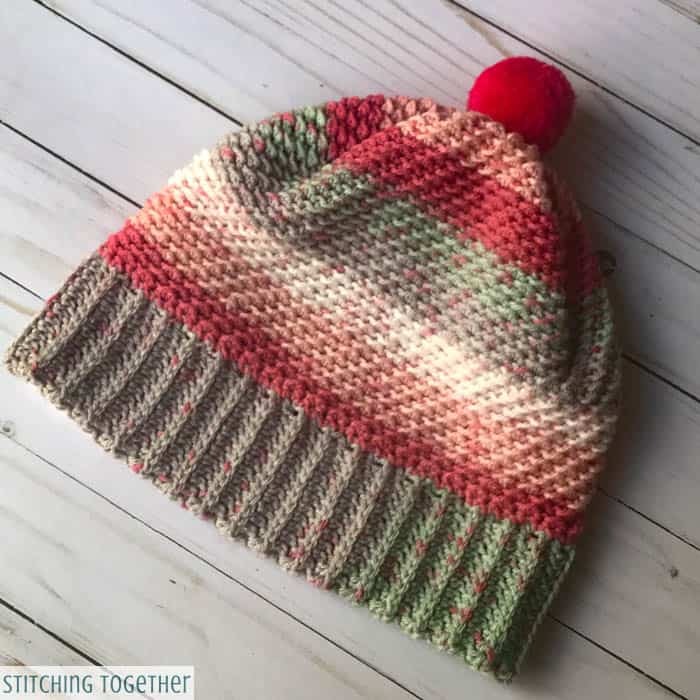 No problem, I love making stuff for them and I thought a similar cupcake hat with a brim and in a lighter yarn would be great! As I was working on the brim of the hat, she asked me who it was for, like she does with almost everything on my hook. I excitedly said, “It’s for you baby girl.” To which she frowned and responded that she didn’t like it and she wanted a pink and purple hat. Ouch! I reminded her that she already has a purple hat that I made for her. Nope, not good enough. She wanted nothing to do with this new hat. I figured it would be best to make the hat in my size so at least someone can appreciate wearing it! So that’s exactly what I did. It has way more fun color than I normally wear, but that is probably good for me! Literally as I finished typing up to this point, retelling the story of my daughter’s rejection of this hat, she came down from nap time, picked up the hat from next to me, and told me she really likes it. STINKER! I should have known. Thankfully I picked up another girlie colored Caron Cupcake so I can make her a different hat. Since the hat is worked by making the brim first, it is super easy to adjust for different head sizes. Right now it is a medium adult size but adding or subtracting a couple of rows on the brim will make it easy to size. Don’t forget to save the Over the Ridge Crochet on Pinterest! 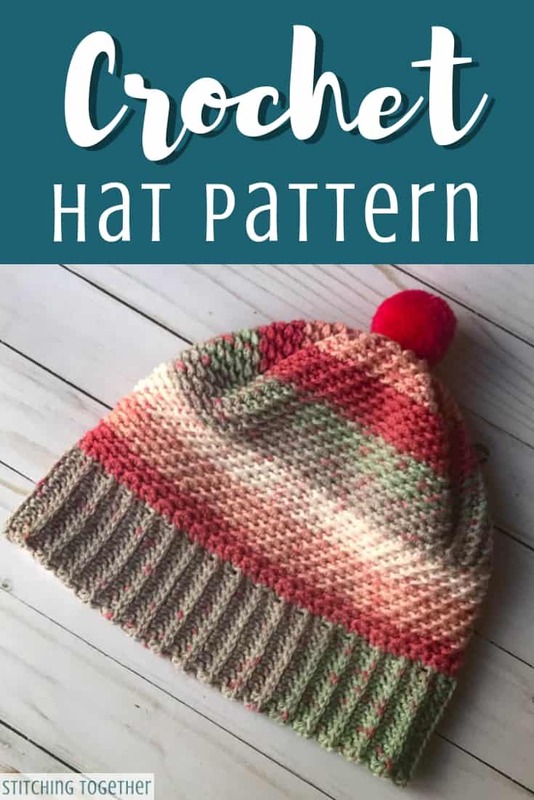 If you prefer, printable PDFs of your patterns, the Over the Ridge Crochet Hat with Brim can be purchased on both Etsy and Ravelry or keep scrolling for the free pattern. 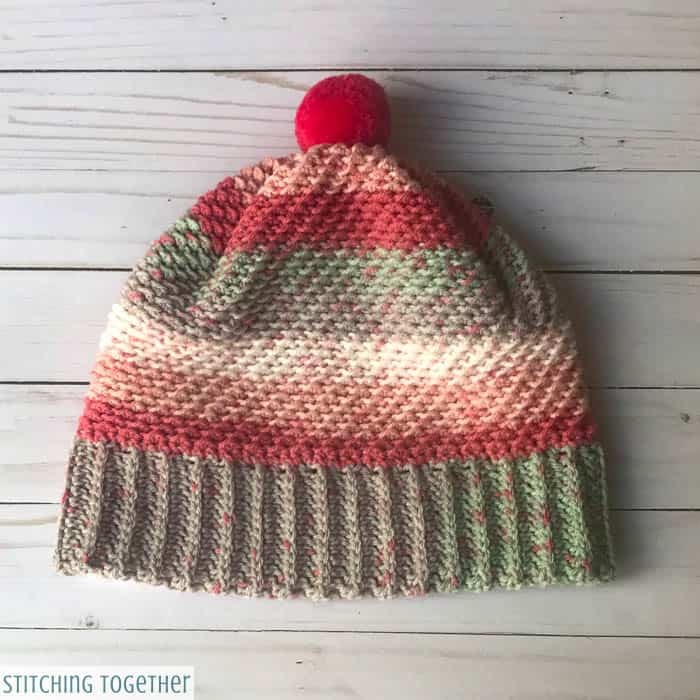 The hat is started by working the brim first. 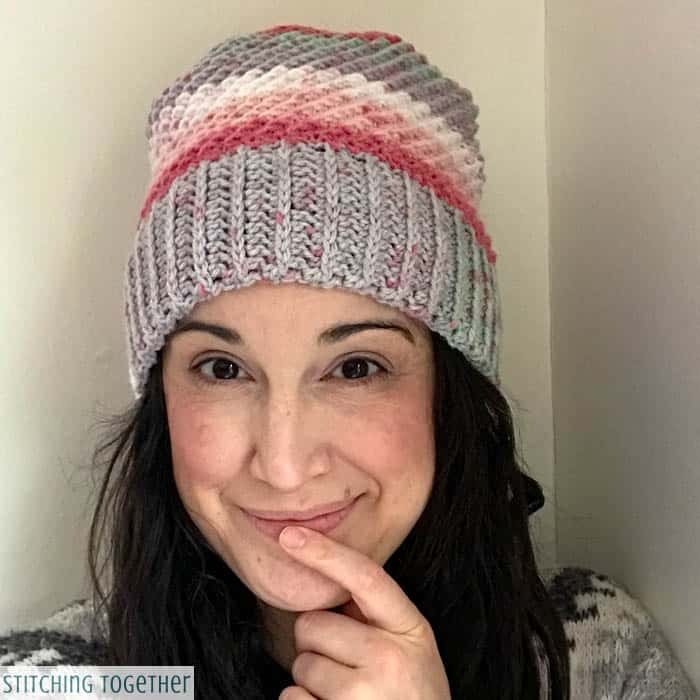 Using the sizes in the ear warmer chart, the hat brim can easily be adjusted for a different size head by changing the number of rows worked. 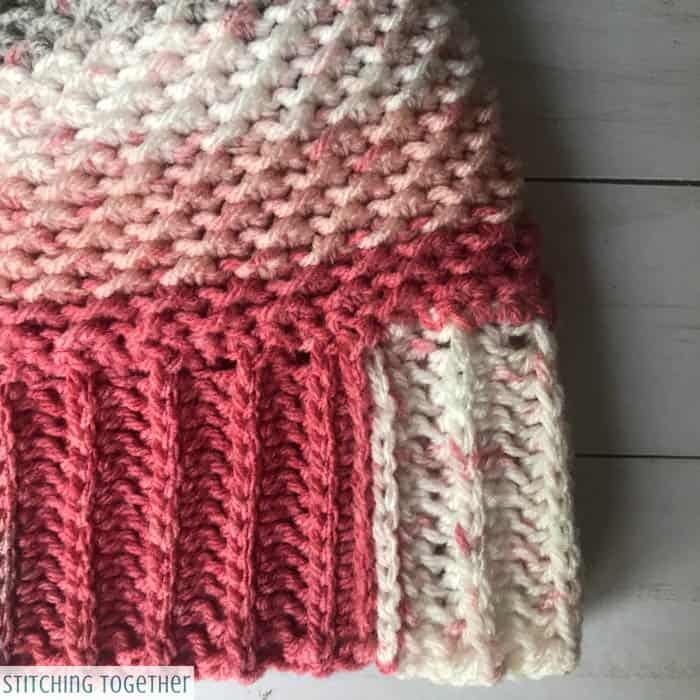 The half double crochet stitches of the brim are worked entirely in the 3rd loop of the half double crochets in the row below. After the brim is joined, a sc round is worked around the entire brim. You’ll want to keep this sc round an odd number of stitches if you adjust the size. 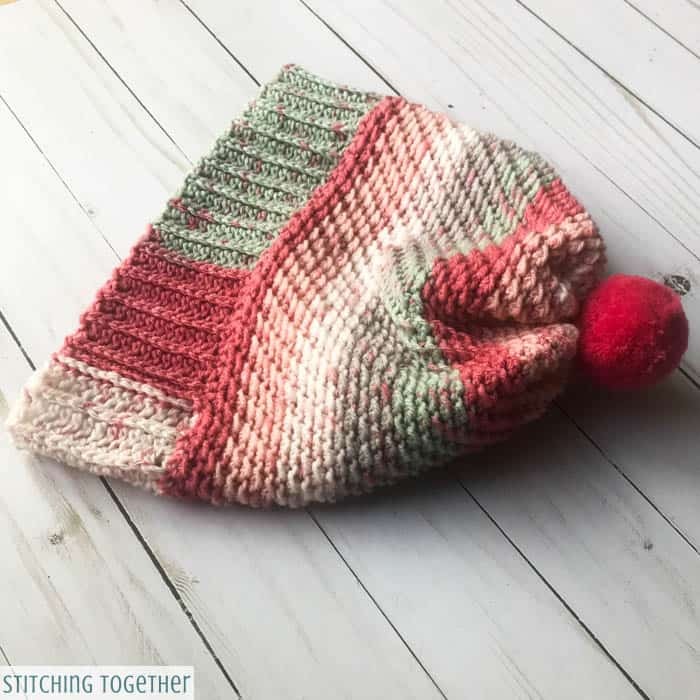 This is the only round that is joined and the slip stitch which joins it is also used to start the crunch stitch for the rest of the hat. 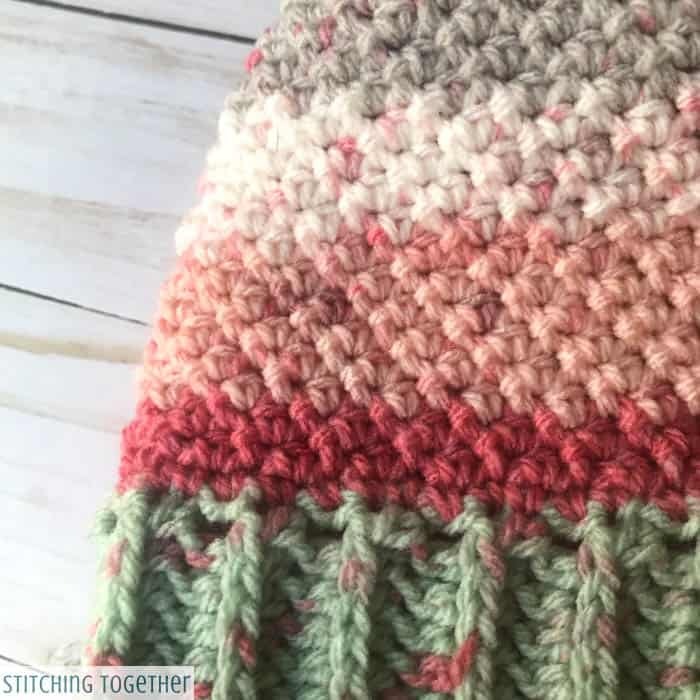 As you work the crunch stitch around, slip stitches will be placed in the half double crochets of the round below and half double crochets will be placed in the slip stitches of the round below giving you a wonderful diagonal texture. I found it natural to work with the wrong side out and flip the hat right side out after finishing it off. Even the texture on the inside is amazing though. Repeat row 2 for a total of 67 rows or until brim is desired length. Hold the short ends of the brim together to form a loop. Sl st or sew the short ends of the brim together. Continue working around for about 34 rounds, or approximately 8.75″ from the bottom of the brim to the top of the hat. Fasten off leaving a long tail. Using a large eye needle, weave the tail through the top of the stitches in the last row and pull gently to cinch closed. Weave in ends. What a Cutie she is too!! Love the story and the hat. Thanks for sharing both! !